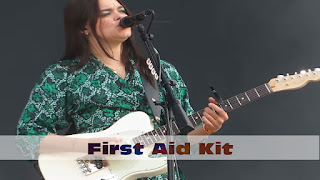 First Aid Kit performing live on the Main Stage at the Rock En Seine Festival in Paris (France), at the Domaine National de Saint Cloud – On Friday, August 24th 2018. First Aid Kit is a Swedish folk duo that consists of the sisters Klara (vocals/guitar) and Johanna Söderberg (vocals/keyboards/Autoharp/bass guitar). When performing live, the duo are accompanied by a drummer, a pedal steel guitarist and recently a keyboard player. In 2008, they became internationally known by their YouTube video cover of the Fleet Foxes's song "Tiger Mountain Peasant Song" that gained significant Internet popularity. They have now released four albums, two EPs and a handful of singles. In 2015 they were nominated for a Brit Award as one of the five best international groups.